Earlier this morning, Apple went ahead and detonated one of the year's biggest tech bombs: the unveiling of the latest iPhones. Easily among the biggest tech events each year, the official reveal made geeks around the world (including us!) tune in. In our case, we traded a couple of hours of sleep just to get dibs on the official announcement when most of the country was still busy snoring. And why wouldn't we? We're talking about the latest spawns of what has been one of the most popular smartphone lines in all of gadget history. Yep, we just had to (especially in an era where smartphones rule). So, how are Tim Cook and co.'s latest and greatest handsets? Are they enough to give every Apple fanboy a geekgasm? Let's just say that both devices are definitely stacked (as expected). First things first. The newest iPhones are more of updated (read: improved) versions of last year's editions than being new devices altogether, hence the "s" on their labels. The iPhone 6s packs a new A9 processor, which is reported to bring a 70-percent performance improvement and up to 90-percent improvement in the visual department compared to the iPhone 6's A8 chip. We all know that last year's iPhones are no slouches so, yeah, even more speed! There's also a "second" chip under the hood, the M9, which serves as a supporting processor when the going gets tough for the handset. For those wondering how many GBs of RAM the iPhone 6s has, Apple is, as with its previous handset releases, still being really secretive so we'll have to wait for specific figures. What we do know is it has up to 128GB of storage and an upgraded 12-megapixel "iSight" rear shooter (last year's model had eight MPs); an autofocus function; and 4K video capabilities. Up front is a secondary 5-megapixel camera with HD recording, panorama option, and face-detection for better selfies. Another nifty feature: the Retina Flash, which increases the device's 4.7-inch display's brightness to serve as an added light source when you use the front camera in low-light situations. No need for a separate flash, yo! Rounding up the iPhone 6s' other notable features are 4G connectivity, NFC for wireless transactions, and Touch ID 2 which Apple claims can log you in to the device twice as fast compared to the fingerprint sensor on the iPhone 6. As expected, Apple also came up with a successor to its first-ever phablet. 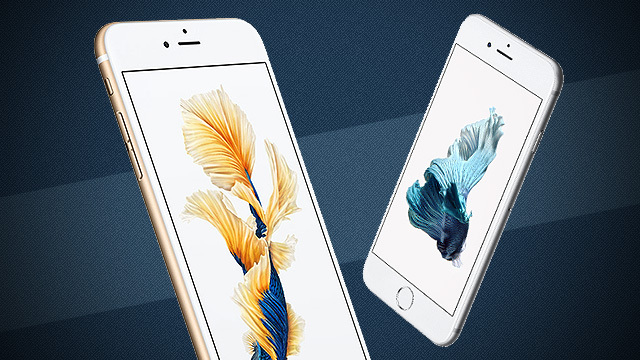 The iPhone 6s Plus is practically the same animal as the iPhone 6s inside. It has the same processor, capacity, and internal features. Heck, it even looks the same although obviously it's significantly larger with a 5.5-inch Full-HD touchscreen dominating its front side. It's also almost half an inch wider and around 50 grams heavier so it's not exactly skinny jeans-friendly. HOT GADGET ALERT: This Wearable Device Is Your Hi-Tech Way To Chat And Get Fit!